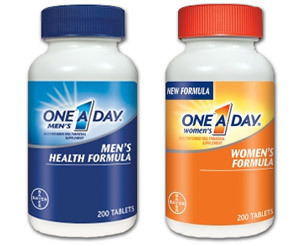 The One A Day multivitamins are made by the Bayer corporation. Currently they are one of the most popular vitamin supplements on the market mainly due to the constant marketing of the product on TV, on the Internet, as well as in magazines and in stores. Being made by a large pharmaceutical corporation also lends a lot of credibility to the brand. Below is our summary of the strong and weak points of this product, based on analysis conducted by the MultivitaminGuide.org team. Low effectiveness: due to the use of synthetic ingredients with poor bioavailability. Synthetic vitamins: The majority of the vitamins included are synthetic. Synthetic Vitamin A (Palmitate) and Vitamin B12 (Cyanocobalamin) may cause mild toxicity if taken in high doses over long periods of time. Incomplete: Missing key ingredients, which are common to higher-quality multivitamins. With an Effectiveness Score of 4.5 on a 10 point scale, the One A Day multivitamin by Bayer ranks number 59 out of the 100 multivitamins we have evaluated. Even though this multivitamin is affordable, we believe it does not provide good value for money. If you are looking for a high quality multivitamin at a reasonable price, see our ranking for the top budget-friendly multivitamins below. How does One A Day compare with other multivitamin brands? The MultivitaminGuide.org website offers One A Day reviews and direct comparison between the One A Day multivitamins and of all major vitamin supplements available on the market. Some of the unique aspects of this guide include comparison of the One A Day multivitamins with 100 other vitamin supplement products, including popular brands such as Centrum, GNC, Equate, Kirkland, Nutrilite/Amway, Nature Made, NOW Foods, Melaleuca, Puritan’s Pride, Herbalife, TwinLab, and Walgreens. The information on this site is the culmination of over 6 years of scientific research and analysis. Each of the reviewed products is evaluated against 4 key parameters, such as composition, bioavailability and potency. Then each supplement is assigned a score from 0 to 10, which enables you to easily compare the effectiveness of different brands. The table below provides a summary of the Effectiveness Scores of some of the more popular vitamin supplement brands available on the market, including the One A Day multivitamins. Any vitamin supplement with a score that exceeds 8.0 is considered to be "excellent". Unfortunately a quick glance at the table below reveals that the great majority of multivitamin products available on the market do not meet that threshold. Using a multivitamin product with a score of 8.0 or above is strongly advised. 34 Jean Carper's Stop Aging Now! Stop Aging Now!